The Tommies have added swift skating, tough-as-nails forward Mike Reich (pronounced "Ree-ch") from the Western Hockey League. The 5'11" 190 lb. 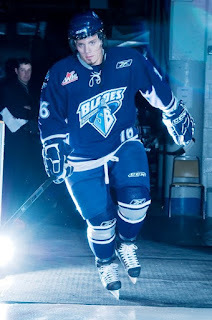 Craik, Saskatchewan native spent parts of five seasons in the WHL, amassing 53 points and piling up 724 PIM in 248 career games. WHL scouts spotted Reich's talent early, with the Spokane Chiefs selecting him 8th overall in the 2003 bantam entry draft. A big scorer entering junior, Reich's feisty play soon earned him a reputation for pugilism. It was a role he was comfortable with, and one his coaches exploited throughout his junior career. In 2007-2008 Reich was voted by WHL players and executives as the Eastern Conference's most irritating player. Commenting on the recognition, Reich said "It comes naturally, I guess. . . . When I was in bantam, I think I had a hundred goals and about 350 penalty minutes. Even in midget, I was at the top of the league in penalty minutes." Sounds like a perfect fit for the LBR. A possible new Tommies' fan favourite. When asked how he saw himself adjusting to the university game from the junior/pro ranks Mike said "quite comfortably.... coming into junior I was looked at as a skilled player with lots of bite . Throughout my junior career I just seemed to be put in more of an enforcer role, which I didn't mind doing but look forward to the university game. I will bring an aggressive/agitating game to the Tommies." And we can't wait to see it!!! Gordie Howe had no CIS eligability left and so St,Thomas landed the 2nd best player from Saskatchewan in MICHAEL REICH. He will be the whole package and a welcome addition to the Tommies. His contributions will be more than one dimentional and are looked forward to with great anticipation;WELCOME MIKE! Good pick up for the Tommies. Reich will be a fun guy to watch and will be disliked by everyone but us!! Welcome Mike! Having had a few days to reflect on this announcement I would like to add a few more comments regarding what we might expect to see.As mentioned in my 1st submission this lad is more than a one dimentional player.Having recruited many players for STU over the years I will predict that he will make MAJOR contributions both offencively and defensively,As coach Eagles has mentioned he will get those opportunities AND be successful in doing so,he has alawys been a good team man who completed assignments as directed and like prior recruits will blossum here at STU,welcome aboard once again and enjoy the ride man. Haha! FINALLY WE'RE FILLING THAT GAP, WE NEEDED A SCRAPPER YES YES YES YES! Yea...to take care of all that fighting that happens in the CIS..
"Reich received a minor penalty for instigating, a major for fighting and a match penalty for eye gouging. Bartley was not penalized." You guys weren't kidding when you said you were replacing Theriault. I trust Barry's opinion but doing research this guy doesn't sound so appetizing. Traded 3 times in a season, released as a 20 year old, multiple offender with high pims and low points? How is he going to make our team better??? What you didn't read (maybe you did but forgot to mention it) was that Reich denied doing it and was upset he was tagged with the suspension. I think he has a tonne to offer since he is now in the position to keep his gloves on his hands. He is still going to be a pest (to bad for the opposing team) but he won't be sent out on the ice to be the enforcer, which has been his role. Obviously he was good at that role but I think the hope is that he will evolve in a non-fighting league because he does have some good credentials. Only time will tell for sure but I think he will be a really good pick up. I'm looking forward to see what this guy can bring and if he is a tough hard working guy, he should be OK.
Another thing, hopefully his hands and fingers have healed. Tough to score goals when you fingers are broken, bloody, and bruised. Once he gets feeling back in his hands he might find the scoring knack he had in Bantam. Start using hand cream to soften those babies up because soft hands turn on red lights. i could see him being a Bourbeau type player. Obviously he cant fight in the AUS, but if he can make a pro team, he obviously brings something to the table. Dont look at his PIMS, hell, Therialt is more of a penalty guy and he was loved by Tommie fans. Guy above me, Gallant was the hottest Tommie scoring wise in the early part of the season because he has good hands. His play tailed off for some reason and he lagged in the 2nd half. I wish people here would look at the type of player and where he has played previously instead of the stats he produces. The guy above you name is Rosoe, call me Roscoe. If he learns quickly to play on the right side of the law he can be a very effective player in the league. If he is a cowboy he will hurt the team. Simple as that. STU has had a history of having "sandpaper" guys that the fans love - the leagues' all-time super agigator Phil Daigle,more recently Seymour, the QU tagteam of Bissonette and Cloutier. All good players who helped STU immensely, but also had trouble with discipline over course of career. It is a juggling act being a super pest and playing inside the law - hopefully he finds the balance and STU will benefit.